Christian Champen broke Kent State’s indoor program record in the pole vault Saturday, Feb. 2 on the final day of the Akron Invitational. 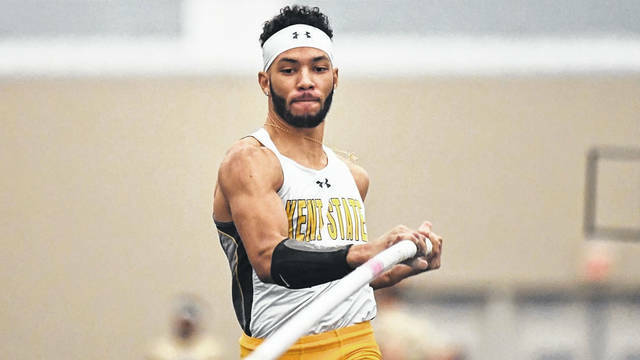 Champen cleared a height of 17 feet, 5.75 inches to place his name atop the Kent State record book and finished second in the pole vault. AKRON — Junior Christian Champen, a graduate of Northmont High School, broke Kent State’s indoor program record in the pole vault, while Kent State won six events between the morning and afternoon session on the final day of the Akron Invitational on Saturday, Feb. 2 inside of Stile Field House. Champen cleared a height of 17 feet, 5.75 inches to place his name atop the Kent State record book and finished second in the pole vault. In addition to being a school record, Champen’s vault ranks 18th nationally on the season. The record was previously set by Jesse Oxley at 17 feet, 3 inches in 2014. Sophomore Jacob Mally finished first in the men’s heptathlon gold division with a collegiate-best 5,351 points. Mally was leading the competition with 2,961 points heading into the final three events Saturday, after taking first in the 60-meter dash (7.30), shot put (41 feet 0.25 inches), and high jump (6 feet, 7 inches) and second in the long jump (21 feet,10 inches) Friday evening. He added a first place finish and career-best time in the 60-meter hurdles (8.33), a second-place finish and career-best mark in the pole vault (14 feet, 5.25 inches), and a third-place finish in the 1,000-meter (2:50.60) to round out the competition on Saturday. Mally’s 5,351 points ranks seventh in Kent State history and tenth nationally. Junior Nicole Yeargin picked up two victories as part of the Gold Invitational in the final session of the meet. She crossed the finish line first in the 400-meter with a career-best time of 55.33 and in the 200-meter dash, clocking another career-best time of 24.25. Both times rank in the top-ten in Kent State’s indoor records (fourth in the 200-meter; seventh in the 400-meter). In the women’s shot put gold division, freshman Gabby Bailey reached a career-best mark of 49 feet, 11 inches to win the event, while sophomore Grace Tennant finished second (48 feet,8.25 inche). Bailey’s mark ranks tenth in program history. In the morning’s Blue Division session, senior Irene Skinner won the women’s 200-meter, recording a personal-best time of 25.14 while junior Trevor Detillion finished first in the men’s shot put with a mark of 51 feet, 9.25 inches. During the Gold Invitational session, the Flashes picked up ten additional top-five finishes. Sophomore Jake Wickey picked up a second-place finish in the weight throw, recording a career-best and Kent State program top-ten mark of 66 feet, 6 inches. Senior Kevin Jones added a fourth-place finish on the track running a 1:54.98 in the 800-meter. Junior Da’One Jordan came in fifth in the long jump, leaping 22 feet, 9.75 inches while freshman Ryan Demaline finished fifth in the shot put and reached a career-best mark of 53 feet, 10.25 inches. From the women’s team, sophomore Alyssa Matheny finished second in the high jump with a 5 feet, 7 inch mark. Junior Mi’Angel Daniels and Skinner added third-place finishes in their respective events. Daniels clocked a time of 8.55 in the 60-meter hurdles, while Skinner ran a 56.53 in the 400-meter dash. Junior Rachel Banks also finished third in the 800-meter, running a career-best 2:10.45. Freshman Angelique Wong clocked a personal-best 25.13 in the 200-meter dash for a fourth-place finish, while sophomore Sarena Choi finished fifth in the long jump, recording a career-best mark of 18 feet, 9 inches. Next up, the Flashes will host the Doug Raymond National Qualifier at the Kent State Field House Saturday, Feb. 9, the first of two home meets before hosting the Mid-American Conference Indoor Championships Feb. 22-23.